Are sagging cheeks making you feel self-conscious of your facial profile? More and more people are searching for anti-aging solutions to help them look and feel younger. Access Family Physicians now offers JUVÉDERM Voluma® as a minimally invasive means of addressing inadequate volume in the face for a youthful complexion. Access Family Physicians in Zionsville, Indiana is led by Dr. Sarah Lynley Rader who is determined to provide each and every patient with an unparalleled medical experience. We offer comprehensive care for patients of all ages and believe every patient deserves a personalized treatment to realize your unique needs. Contact us today to schedule your consultation to learn if JUVÉDERM Voluma® may be right for you! JUVÉDERM Voluma® is a safe and effective anti-aging solution that is approved by the FDA to lift the midface for a more energetic appeal. Equipped with hyaluronic acid, JUVÉDERM Voluma® works to address midfacial volume loss caused by natural aging. This dermal filler is administered beneath the superficial layer of skin through a very fine needle, immediately restoring volume and raising the cheeks for a softer-looking contour. What results can I expect after my JUVÉDERM Voluma® rejuvenation? Patients who are rejuvenated through JUVÉDERM Voluma® can notice instantaneous results of a smoother-looking midfacial outline. With an optimal treatment plan, Dr. Rader and her team can help you achieve a youthful profile that may last up to two whole years! Ultimately result will vary from person to person. How many JUVÉDERM Voluma® treatments will I need? Each patient has unique aesthetic goals they would like to accomplish and as such, everyone will require a personalized JUVÉDERM Voluma® treatment plan. Dr. Rader and her team will help you determine how many JUVÉDERM Voluma® treatments you may need during your consultation. Who is a good candidate for non-surgical cheek augmentation through JUVÉDERM Voluma®? 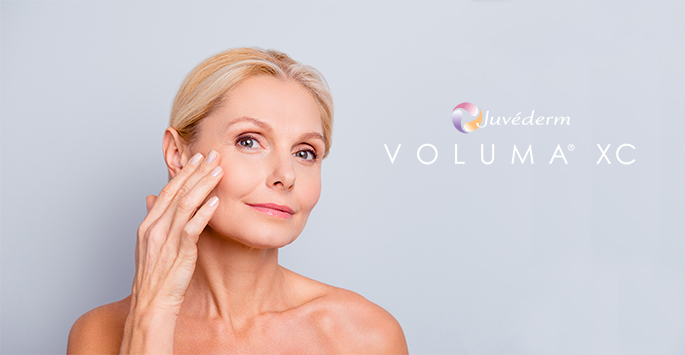 If you are looking for a minimally invasive, safe and effective anti-aging solution to augment your midface, JUVÉDERM Voluma® may be an ideal option for you. Contact us today to schedule your consultation to learn if JUVÉDERM Voluma® may be right for you!